Have you ever seen a rock water fountain? It's basically an arrangement of stones, a water pump and spout, and water. Simply staring at the hypnotic ripples of water cascading down the sides of the rocks helps you de-stress. Before you know it, you'll be asleep in a sea of rhythmic, dribbling, burbling whispered song. 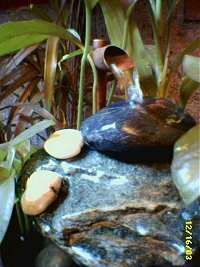 The photo above is the rock water fountain in the house. Jun spruced it up by adding a few plants in the bowl that holds the water and the stones. Usually, rock water fountains do not contain plants. But that doesn't mean you can't innovate, right? Adjustable-flow waterspout is in the center of fountain (hidden by stones). You can change the arrangement of rocks (even slightly), and change the flow of running water over the rocks and its sound.